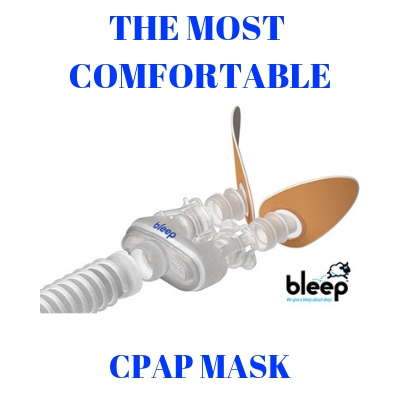 After your physician has appointed the right type of CPAP device that you should use it to get the best CPAP therapy, it is time to choose a perfectly fitting mask. The CPAP mask must fit perfectly over the face to offer you maximum comfort during therapy and to help avoiding mask leaks. If the mask is too loose and does not offer the best seal, air will leak and therapy is not efficient enough; if the mask is too tight, the mask and the straps might cut into the skin and cause discomfort and irritations. You need an Nasal CPAP mask with side straps if you have tried to wear the full face mask but you feel quite claustrophobic with it. Such a mask is also perfect for patients who do not want their field of vision to be obstructed (while they read/watch TV for example). The Nasal CPAP mask with side straps is a good option for patients who wear glasses during daytime therapy. These masks resemble the regular Nasal CPAP masks, with the difference they feature a special foam piece that will offer seal around the nose. The foam cushion offers gentle yet firm seal, and these masks are good for patients who require high pressure CPAP therapy- because the mask offers perfect seal without exerting any pressure that might be discomforting. Patients who require high pressure therapy will also find efficient the nasal masks which provide seal through suctioning to the face. These masks offer firm seal, and they allow the patient to move freely during sleep without the mask moving from its place. There are also nasal masks with pillows available. This mask has two special prongs that will be inserted into the nasal cavities. These masks are absolutely lightweight and unobtrusive. These types of masks cover both the nose and the mouth. The full face masks are recommended for patients who usually need to breathe through the mouth as well. Or, the full face mask is a temporary solution for patients who struggle with congestion and stuffy nose during allergy seasons.